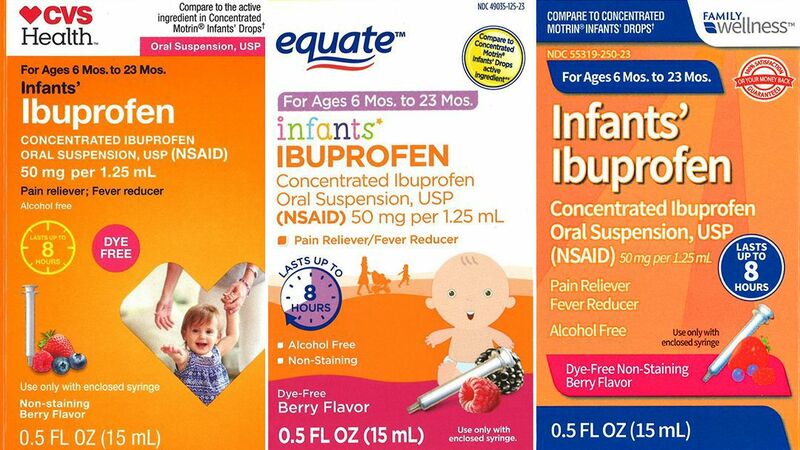 NEW JERSEY — Pharmacies and retailers are pulling liquid infant ibuprofen from the shelves after concerns that the medicine may contain a higher concentration of ibuprofen than advertised. New Jersey-based Tris Pharma, Inc. is voluntarily recalling three lots of the liquid ibuprofen sold under Walmart CVS and Family Dollar house brands. The product is used as a pain reliever and fever reducer and was packaged in 0.5 ounce bottles for the recalled lots. Consumers with questions regarding the recall should contact Tris Pharma’s customer service line at 732-940-0358. Consumers should contact their healthcare provider if they have experienced any problems that may be related to taking or using this product. Additional information regarding the recall is listed below. The post Infant ibuprofen being recalled from shelves of Walmart, CVS and Family Dollar appeared first on News Radio KMAN.